The Westinghouse Electric Corporation is an American manufacturing Company that was founded in January 1886 by George Westinghouse, firstly as Westinghouse Electric Company and renamed later as Westinghouse Electric Corporation. Westinghouse Electrical Company LLC is a US based company of nuclear power that is controlled by Toshiba Group and offers nuclear products and services for the utilities internationally that includes nuclear fuel, instrumentation, services and maintenance, control and design of nuclear plants etc. Now in 2014 Westinghouse builds and operates around one half of the world’s operating nuclear plants. In the Pittsburgh in the suburb of Cranberry Township, Pennsylvania, Westinghouse’s world headquarters are located. Westinghouse deals in wide variety of products including home products, lightening, power, and electronic equipment. The company promises that they provide an innovative, high quality and reliable products and also the customer service. They present combination of ground breaking technology along with rock solid dependability that made them one of the most trusted brands of the world. Their products have latest standards for price and surroundings, rigorous testing is performed for maintaining their standards and high quality performance. Their products packed with lots of features and new advancements make your life at ease. Nowadays, every one of us wants to have best lifestyle and safety in our lives. As we safeguard our family hence also provide backup or portable power at work and play, through Westinghouse WH7500E gas powered portable generator that gives power up to 7500 running watts and a maximum starting output of about 9000 watts along with providing the owner with many benefits and amazing features which are usually seen only in more expensive models. 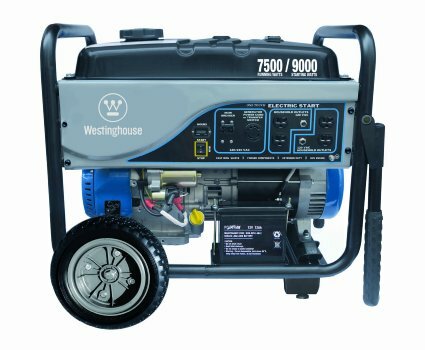 The Westinghouse WH7500E gas powered portable generator is easy to start; it’s just one touch start up mechanism by electric start system and also includes an LCD hour meter. Westinghouse WH7500E portable power generator provides quiet operation through Westinghouse’s Pulse Flo muffler and also comprises of four standard household outlets that is ready to power your devices easily. Westinghouse WH7500E is easy to operate as it has simplified control center. It also includes everything to get started once it is right out of the box, comprising of wheel kit, handle kit, funnel, oil and tool kit. This portable generator has 3 years limited warranty by its manufacturers and it is EPA approved. This model is not compliant hence it is not for sale in California as the units sold to California must be a CARB compliant. Westinghouse WH7500E portable generator is powered by a high output and it is durable 420cc Westinghouse XP Series engine. The WH7500E portable generator features overhead valve design for an excellent performance, forged pistons, and cast iron cylinder sleeves for low consumption of oil and connecting rods for proven strength make it distinct and best. It has three positions electric start that allows ease of operation and it is also complimented by a comfort grip manual recoil handle, transistorized ignition and compression release. An efficient engine at least gives you runtime up to 13 hours at 50 per cent load along with its 6.6 gallon tank. Westinghouse WH7500E portable generator has low loss, high efficiency alternator lamination that helps to increase electrical output and decreases fuel consumption too. Automatic voltage regulation delivers reliable and precise voltage control mechanism for demanding applications. Its fan guard of cast iron ensures safe operation with the maintenance of free brush excitation that ensures zero down time operation. It features all steel construction and also has fully enclosed electrical connections. This model is able to withstand in the harshest weather and environment. The WH7500E features two 120 volt push button circuit breakers for excess current protection and also a toggled mainline of 240 volts circuit breaker is for safe operation. It also has a quarter turn Nema twist lock connector that provides a secure connection for available power cord and other devices. The WH7500E portable generator has color coded touch points that make the interface intuitive and easy. The combination of robust never flat tires and ergonomically designed dual folding handles make available easy transportation to and from any job sites. In the box you will get tool kit and operating instructions as it needs little bit assembling before use. Westinghouse power generators are perfect for the protection of your home from unexpected power outages, and they are also useful for powering many home appliances such as electric ranges, home power tools, security systems, radios, lights, electronics and more. For the selection of perfect generator for your need, you firstly need to determine the starting watts needed for the item to start up. The reason of knowing this is that appliances and tools with electric motors often need additional surge wattage at its start-up that could be doubled or tripled of the normal running wattage requirement. For best results you must know the required surge watts and make sure that you choose the generator that could fulfill your requirement of additional start up surge wattage. And be careful that you are typically not start more than half of the units at the same time.